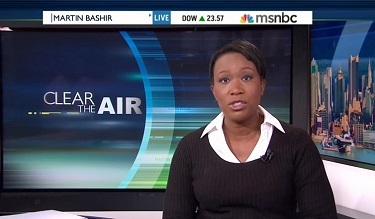 In her closing "Clear the Air" commentary on the November 4 Martin Bashir program, substitute host and longtime Florida resident Joy-Ann Reid rewrote the political history of Republican-turned-Democrat Charlie Crist, who announced today that he will run for the governorship in the 2014 election cycle. [H]ere's the thing. Republican politics which is so toxic right now, has shown the danger of purity tests. If Crist can win, would Democrats be starter to embrace the convert rather than risk losing? That's essentially what happened in 2010 when enough Democrats stuck with the purer candidate, former Congressman Kendrick Meek, to throw the Senate race to Marco Rubio. Meek, you may recall, actually ran for and won the Democratic Party nomination in August 2010. Crist, by contrast, chickened out of the GOP primary rather than risk losing to Marco Rubio, backing out of the primary race in April so s to register as an independent by the filing deadline. In the general election, there were Democrats who defected to Crist, of course, but many stayed loyal to Meek, who had, after all, won a Democratic primary fair and square. Democrats didn't stick with Meek because he was "the purer candidate" so much as they stuck with him because he WAS a Democrat and Crist was a craven opportunistic who could not be trusted. Why should Democrats have turned away from the actual Democrat to support an opportunist who turned tail on his own party? Since that time, of course, Crist appeared on stage in Charlotte before the Democratic Convention as an independent wholeheartedly endorsing Obama and then, months later, making official his party jump to the donkey party in December. Even so, Crist hasn't been a Democrat for an entire year and Reid expects Democrats to throw away their alleged purism in the interests of winning back a governor's chair. What's more, in the process, Reid illustrates just how casually the liberal media establishment treats liberal African-American candidates who get in the way of the preferred national narrative. In 2010, there was just one black senator in Congress -- Roland Burris (D-Illinois) -- and he was not seeking the seat in the special election that November. Kendrick Meek would likely have still lost to Marco Rubio had Charlie Crist not been in the way, but, who knows? In a two-way race, it's thoroughly possible, if not probable, that Meek could have squeaked out a victory. Instead, then, as now, liberals hyped Crist as a pragmatic moderate who was pushed away from the GOP because it was in the thrall of the Tea Party. It's three years later, and that tired, discreditable meme is still alive and well on MSNBC.